Mixed use project encompassing 2 city blocks along the city’s main gate to the beach. The project features a public plaza, 350 residential units and 40,000 sq. ft. of retail. Two 15-story mid-rise buildings are connected with 6-story garage with a roof-top amenity deck. Four-story buildings complete the project by providing retail space along Federal Highway and defining an interior arrival courtyard. Provided landscape architecture and planning services for the entire project including streetscape, planting, lighting &amp; irrigation. 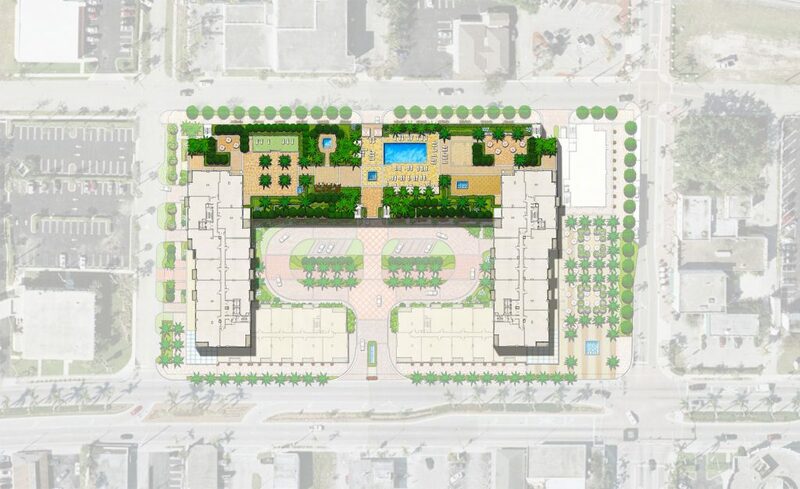 The public plaza is designed with a series of outdoor spaces and a fountain anchoring one of the most visible intersections in Boynton Beach. The amenity deck provides spectacular views of the Intracoastal Waterway and features pool, spa, fountains, summer kitchens, cabanas and lush tropical planting.